Love's Travel Stop, Dollar General and My Place Hotel are all moving through the permit process. Even though none of the proposed businesses is quite ready to break ground, the city of Madras is working with three diverse businesses that are preparing to build within the city limits. Developers for Love's Travel Stop and Dollar General have both secured site plan approval from the city, in addition to funding from the Madras Redevelopment Commission for urban renewal, for their locations on the south end of Madras. On the other end of town, Cross Keys LLC has proposed a My Place Hotel, to be located just north of the Inn at Cross Keys Station. That project will be considered for funding at the MRC's next meeting on Wednesday, Oct. 10, at 5:30 p.m., in the Madras City Council chambers in the City Hall. 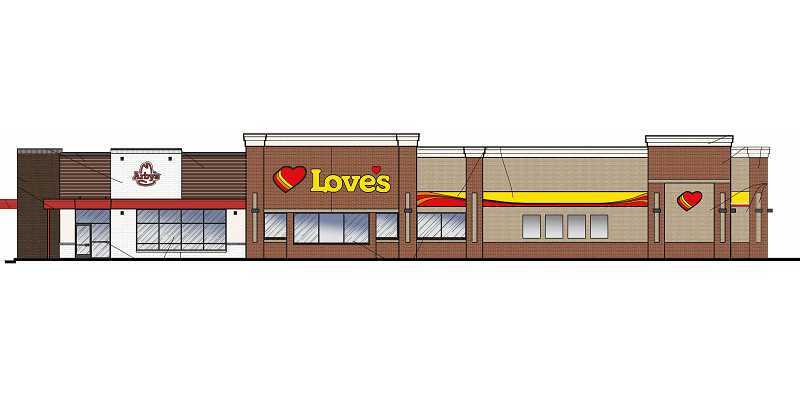 Love's Travel Stops and Country Stores Inc., of Oklahoma City, Oklahoma, seems to be moving forward as quickly as possible with plans for a travel stop on the west side of U.S. Highway 97, directly across the highway from Hall Road, the Oregon State Police office, and Burger King. "I'm excited about it and I know the Love's family is," said Kym Van Dyke, who works on real estate for the company, and met with the Madras Redevelopment Commission last month, to iron out details on the project. The company, which scouts out locations along busy highways, approached the city, with plans to build the truck stop. "We're not anywhere on (Highway) 97," said Van Dyke, who was impressed with the truck counts on the highway. On a major interstate, such as I-5, he expects truck counts to average 80-90 every 15 minutes. On a secondary, rural route, such as Highway 97, he anticipated that the count would be 30-40. "I just counted 48," he told them, adding, "38-48 for 15 minutes is way more than average." The MRC has approved a $350,000 grant over five years for the project to improve the city's infrastructure. "This project has several merits," said Nick Snead, director of the Madras Community Development Department, who oversees the MRC. "It's building needed infrastructure around the property that's consistent with our transportation system plan." The developer will extend Hall Road on the west side of the highway the entire length of the property — about a quarter of the way to the Culver Highway. "As the land develops, we'll be able to obtain right of way and improvements all the way over to Culver Highway," said Snead. "They are also dedicating some right of way along the west property line for a future north-south road that will connect Fairgrounds and Colfax," he continued. As a condition of the grant, Snead said, "They're going to improve Highway 97 with the city's street standard, which includes sidewalks, curbs, landscape swale, decorative street lights and street trees." "All of the local travel centers are important to our community, especially when you look at the impacts of freight trucks to our downtown businesses, in terms of where they park, blocking businesses, signage," he stressed. "We're trying to get these freight trucks, who really don't want to be parked on the highway, to places where they can eat, shower and obtain basic truck service." Van Dyke said that the company plans to start construction as quickly as possible after the county approves its building permit. "Our tentative schedule will be to start construction soon, but we do not have any specific date yet," he said. "Typical construction time is eight months. We are excited to be part of your community." Dollar General, a Tennessee-based variety store, is seeking to build a 9,100-square-foot building on a 1.33-acre lot, subdivided from a 2.77-acre lot, owned by Parr Lumber Co. The lot, situated on the east side of U.S. Highway 97, just north of Brush Lane and across the highway from Aaron's Sales and Lease, is zoned for corridor commercial development. "They have not yet filed for a partition," said Snead. "Purchase is contingent upon obtaining the necessary development permits. They have site plan approval and MRC grant funds." The MRC intends to grant the project $80,000 to offset construction costs for improvement of the Highway 97 frontage and paving of Brush Lane, he said. "After Dollar General goes in, you'll have one gap in the sidewalk all the way from Burger King to Safeway, and the city's working with ODOT on a grant to fill that in," said Snead. The MRC will be considering $400,000 over five years to assist a My Place Hotel with development costs of a north-south street, parallel to Highway 26. Plans are still in the early stages. The street would connect the Inn at Cross Keys, My Place Hotel and future development with Northwest Lee Street. The developer would also be required to extend the sidewalk on the west side of Highway 26 to the northern end of the property. The three-story 64-room hotel would share Inn at Cross Keys' amenities, such as its swimming pool and continental breakfast area. The My Place Hotels franchise has locations in 21 states, including a hotel located in Bend.